Your baby will be bouncing in joy with a doorway jumper, promoting exercise, engagement and entertainment all bundled in one. When your little one can hold their head upright without assistance at approximately four months old, doorway jumpers can offer many benefits during this stage of development. 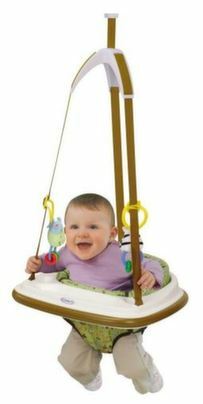 Doorway jumpers make exercise fun, allowing baby to bounce, swing and rock while strengthening leg muscles and developing large motor skills. Baby also learns that by moving their legs, feet and toes they bounce, building self-awareness. In other words, baby can make things happen! [/column] [/column-group] Detachable toys make jumping even more entertaining, as infants explore the colorful objects within their reach. Grasping and handling the small toys that come with many baby doorway jumpers help to foster hand-eye coordination and fine motor skills, as well as to teach your baby cause and effect. As most mothers probably already discovered, during this stage of baby’s little life they easily can become restless and bored. Most infants can’t get around on their hands and knees or feet, yet they yearn for the opportunity to move, rock and explore. You’ll enjoy the baby jumper and its benefits as much as your little one, as the two of you giggle, bounce and bond during playtime together. Jumping with joy is only part of the fun with Graco’s Jump N Jive Doorway Jumper. Your precious one will also have a party bopping to the beat, as they step on the interactive musical mat. Parents agree that their babies love this feature, as it appeals to their baby’s auditory senses. When your child gets too big for the jumper, the mat conveniently transitions to a dance pad. The batteries are included. The baby doorway jumper also comes with two toys that attach and detach to permanent rings held on the jumper straps. You can even attach some of your baby’s other favorite hand toys. The plush and comfy seat pad cuddles your baby, while a surrounding tray conveniently holds a rattle or other small playthings. Popping with color and geometric patterns, this jumper is designed for both girls and boys. 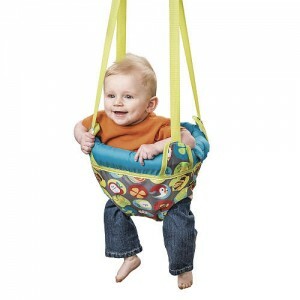 Overall, the term baby activity center better describes this fun-filled, multi-featured jumper. Simply attach Graco’s Doorway Baby Bouncer to your door frame for baby’s non-stop bouncing pleasure. A special attachment creates an easy and simple way to secure the jumper to your frame. A play tray with two interactive toys will help to develop baby’s fine motor skills, while jumping advances large motor skills. In other words, your baby will be learning and exercising while having a blast. The parent-friendly plastic dome prevents the straps from twisting and turning, so you can easily take your baby in and out of the doorway jumper. This is a convenient feature that sets this jumper apart from many others. For your precious little one’s safety and security, the jumper provides a sturdy spring that also features a hidden safety cord. Evenflo’s ExerSaucer Door Jumper is a simple, yet perfect plaything. It doesn’t offer many bells and whistles, but provides plenty of pure and healthy, bouncing fun. The framed seat acts like a little saucer and encloses your baby snugly for comfort and safety. 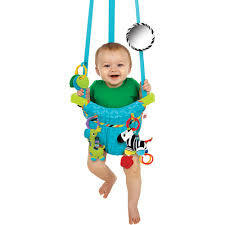 You can attach your baby’s favorite toys to the loops conveniently located on the doorway jumper, keeping baby even more amused while bouncing around. You will be at ease knowing the door frame clamp is sturdy and supports the baby jumper securely on door frames 3 to 6 inches wide. If you are tight for space, this jumper features a trim design, so it doesn’t take up much room unlike other bulky playthings. Another handy feature is that Evenflo designed the jumper to be easily packed and transported, so you can take it to grandma’s house or anywhere else your baby needs a little exercise and playtime. 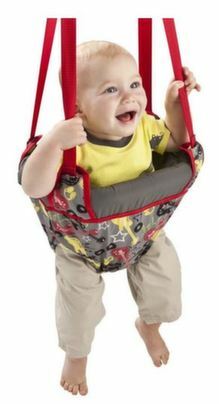 A baby jumper unto itself is a fun event for babies, plus they are designed to keep their developing leg muscles active. After a few minutes in a baby jumper, parents have reported that their babies sleep better at night and if your baby is extremely active, a jumper helps to expend the baby’s excess energy. Baby doorway jumpers have many different characteristics, based on your baby’s needs. Basically, they are made up of a seat, which is suspended from straps that are attached to bungee styled elastic straps or stretch suspension straps. The suspension straps are affixed to a clamp that attaches to a door frame. Not only does a baby doorway jumper allow an outlet for active babies, but it is a great way to build back and leg muscles, as well as enhance a baby’s motor skills. Doorway baby jumpers are also important to introduce babies to a proper neurological development. Jumper toys for baby are important to expose babies in the development of their neurological growth. This exciting and fun device aids in a baby’s movement and sense of balance, as well as to help parents watch their baby’s sensory development. Also, with the fun tag (toys) attachments that can be affixed to a doorway baby jumper, a baby is further introduced to their touch receptor senses. a. Weight: Baby doorway jumpers should be able to hold your baby’s weight, even as they grow. b. Seats: Seats should be properly lined with extra padding for the comfort of your baby. Removable seats for washing are even better. Also, models that allow for height adjustments are a great investment. c. Suspensions: Do not buy baby doorway jumpers that only have one elastic suspension strap because this style can swing too much to the left or right, bumping the baby into the doorway frames, resulting in injuries. 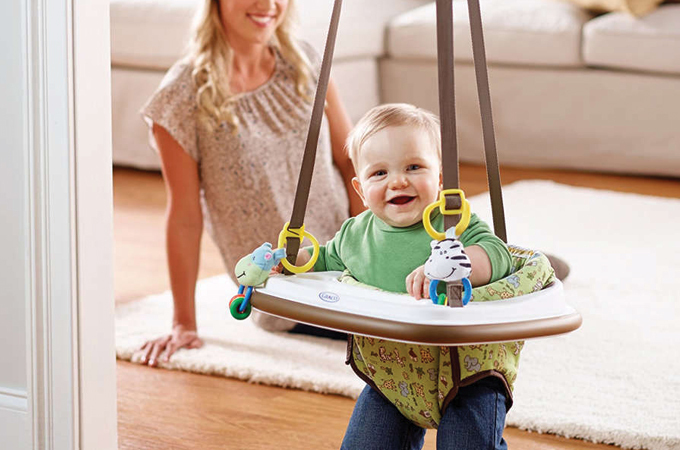 Two or more elastic straps help to keep your baby in place as they gleefully bounce up and down. Also, make sure that the suspension cords are padded and covered over. d. Adjustments: Some doorway jumpers allow parents to adjust their height, which is important as your baby grows. It is important that the doorway jumpers allow the baby’s toes to touch the floor, so the baby can push off. e. Storage: Baby doorway jumper models are available in styles that allow parents to fold up safely for storage when not in use. Stop placing your baby in a doorway baby jumper when they exceed the weight and height limits, as well as when they begin to walk (use from ages 4 months to walking), where they can climb out or they want to explore more of the jumper’s parts. Many baby doorway jumpers allow parents to exchange the type of toys that can be attached to them. However, make sure that the toys are safe for your baby to play with, such as nothing that has parts that can become loose, no pointy parts, and no hard plastic toys. Instead, colorful fabric style fun tag toys with music is always a winner! Doorway baby jumpers are available in models that are designed for the progress of your baby’s growth. Character style baby doorway jumpers made in the form of colorful cars, fun animals or cartoon characters. There is also a model that can be affixed to a door frame or a ceiling, that is scientifically designed to improve a baby’s ability to walk on the soles of their feet rather than the models that promote tippy-toe development. It is a fun exerciser, more than a standard baby bouncer, and does not contain toys or trays, but is sturdy and well padded. 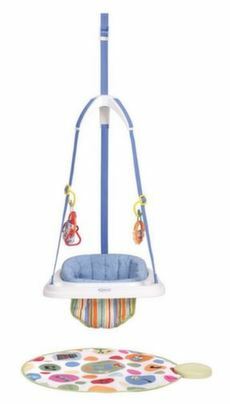 Other baby doorway jumper models come equipped with a soft activity mat that is placed directly under a baby’s feet as they bounce up and down. A comfortable pillow is also provided for the baby and is placed behind a baby’s back to support them. The baby doorway jumper activity mats help to keep baby’s feet off of bare cold floors, while jumping and bouncing. Many activity mat models also convert to a storage bag for the doorway jumper so that it can be carried wherever you go. Baby doorway jumpers are a great activity for babies that encourages their physical and emotional development. They are fun for babies aged three months, especially if they can hold their head erect, up until they are too heavy for the seats. Doorway jumpers also enable your baby to remain upright so that their curiosity is satisfied in watching their world around them. Babies love doorway baby jumpers, so parents choose wisely and safely with the tips provided above. There is nothing more enjoyable to the ears of parents than the giggles of their baby who is bouncing up and down in a baby doorway jumper.